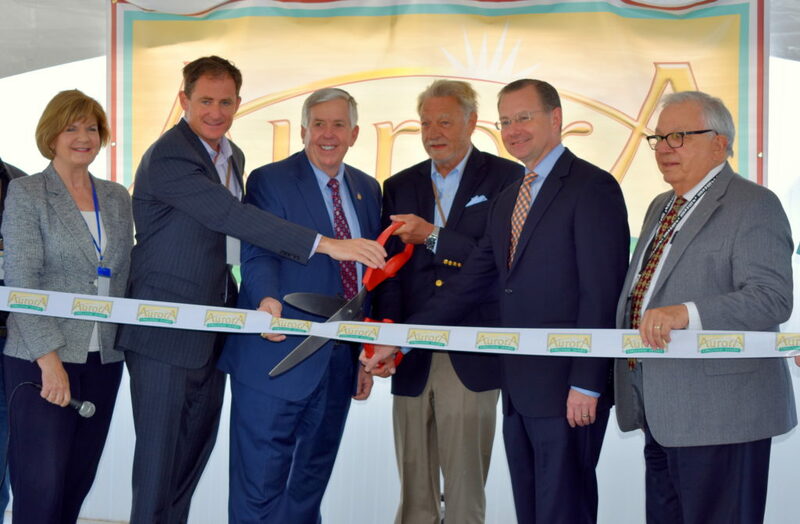 Uncategorized – REDI | Regional Economic Development Inc.
Today state and local officials gathered for a special ceremony in Columbia to officially open Aurora Organic Dairy’s 127,000 sq. ft. milk production and storage facility. The plant is the company’s second milk bottling facility and is expected to have created more than 100 new jobs in the local community by year’s end. Aurora Organic Dairy is the leading producer of store-brand organic milk and butter for U.S. retailers. Based in Boulder, Colo., it operates a heifer farm and organic dairy farms in Colorado and Texas, as well as organic dairy processing plants in Platteville, Colo. and Columbia, Mo. Organic agriculture, animal care and sustainable production are the cornerstones of AOD’s business. Its processing facilities and each of its farms are certified organic by USDA National Organic Program accredited certifiers and certified by Validus, a leading independent animal welfare auditor. AOD is involved in overseeing organic standards from cow to carton. It monitors the entire product lifecycle, to ensure quality from its farms to its processing facility. For more information, visit www.auroraorganic.com opens in a new window. Beyond Meat announced in June that it will increase its manufacturing footprint in Columbia from 30,000 to 100,000 sq. ft. Demand for Beyond Meat’s innovative plant-based products continues to skyrocket. This expanded capacity will help support Beyond Meat’s popular line of plant-based fresh meat products as well as provide for increased growth across new product launches moving forward. The new facility in Columbia will generate more than 250 new jobs in 2018. “We first came to Missouri in 2009 to access the outstanding research being conducted at the University of Missouri. We have been investing in, and growing together with, Columbia, MO ever since, and I’m pleased to announce this latest manufacturing investment, our largest to date. Our expansion not only brings more jobs and opportunity to this special community but also furthers Missouri’s position as a leader in the production of plant-based meat,” said Ethan Brown, CEO and Founder of Beyond Meat. REDI assisted Beyond Meat through its decision-making process and announcement in 2012 that it would locate in Columbia. REDI provided temporary office space for Beyond Meat during the construction of the production facility. The Boone County Commission voted on September 20 to approve Chapter 100 Revenue Bonds for the new Northwest Medical Isotopes facility to be built in Discovery Ridge Research Park. The bonds allow the county to provide financing to help the company build its Columbia facility while giving it a 50 percent tax break on real estate and personal property taxes over the next 10 years. After the tax breaks, the company will pay an estimated $6.5 million to local taxing districts over the next 10 years. All the local tax districts affected voted in favor of the incentive. NWMI will make a $108 million investment in the plant and will create 104 new jobs that will pay above the county’s average wage. Northwestern Medical Isotopes announced in 2014 its plans to build a facility in Columbia, and received its building permit from the Nuclear Regulatory Commission in May of this year. Plans are to break ground on the facility in early 2019. The facility will be primarily used to produce molybdenum-99, which is used in medical scans for cancer, heart disease, and bone and kidney disease. 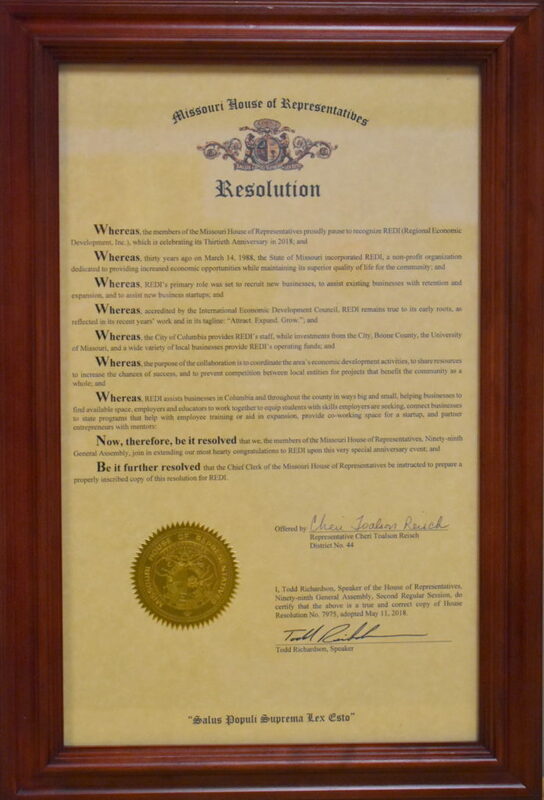 The Missouri House of Representatives honored REDI with a resolution honoring and congratulating REDI on its 30th anniversary. 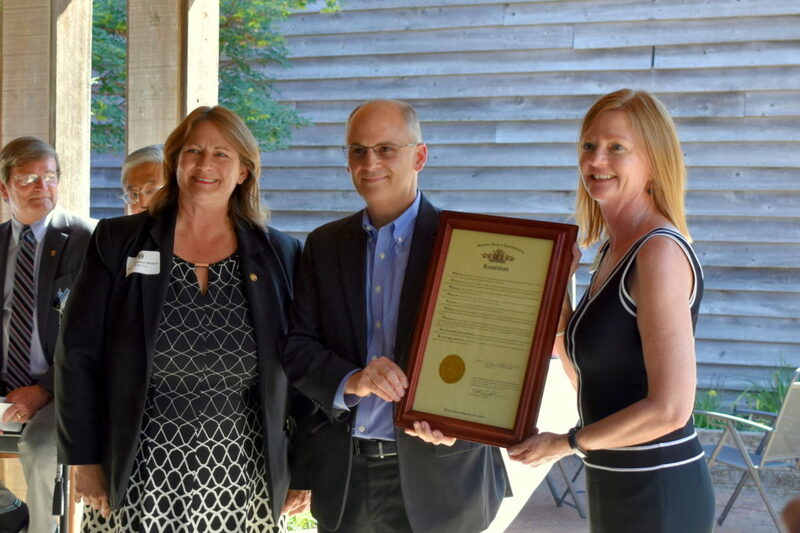 State Representative Cheri Toalson Reisch presented the framed Resolution to REDI President Stacey Button and REDI Executive Vice President Bernie Andrews at the REDI quarterly event June 5. Now, therefore, let it be resolved that we, the members of the Missouri House of Representatives, Ninety-ninth General Assembly, join in extending our most hearty congratulations to REDI upon this very special anniversary event.